For twenty-eight years now, I have performed a ritual at the end of December. It’s the way I wrap up each year and gain some perspective on my life. I blogged about this last December and got such good response, I thought it may be helpful again. What are my fondest memories of 2013? What were the “big projects” I completed during the year? What were the defining moments during the last year? What did I procrastinate on and fail to get done? What books and mentors had the greatest impact on me? Why? Am I closer to my friends and family from my activities this year? What will be my biggest goals as I move forward into 2014? Where did I neglect to live up to the standards I set for myself? What am I committed to do this next year, to fulfill my “Life Sentence”? Answering these questions allows me to accomplish two objectives. First, it forces me to focus on the important things in my life and not get lost in the trivial. Second, it furnishes me a platform to set goals for the new year. If you don’t already have a “review plan,” give it a try. On Thursday, I plan to share a second ritual I perform, as we launch into a new year. 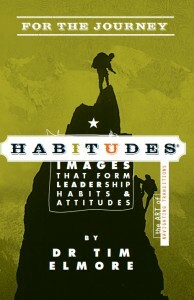 Help students successfully navigate life’s transitions in 2014 with Habitudes for the Journey: The Art of Navigating Transitions.